Ed. 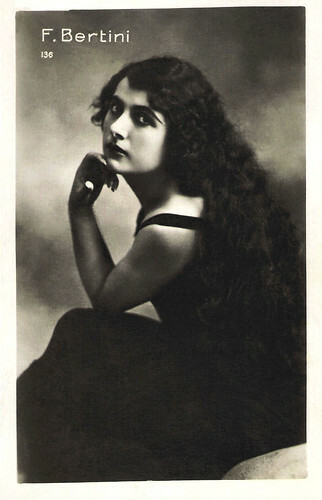 G. Vettori published thousands of film star postcards during the 1920s. 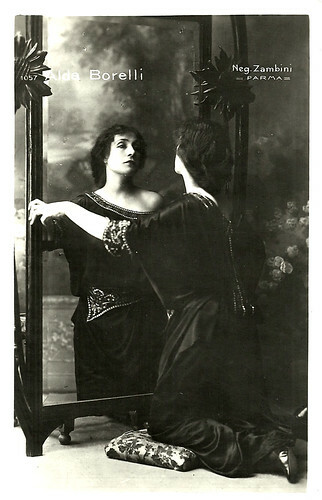 The Italian publisher, based in Bologna, made black and white postcards of both film stills and studio portraits and the subjects were national film actors but also international stars. 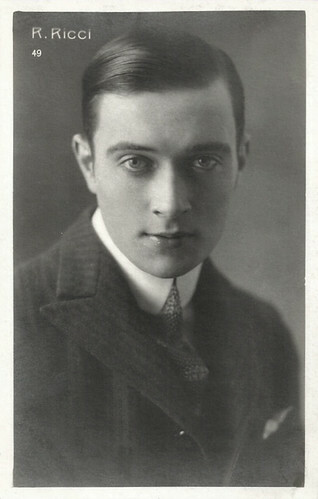 For this post we chose both cards with famous Hollywood stars like Rudolph Valentino as well as with less know Italian actors like Nerio Bernardi and Renzo Ricci. 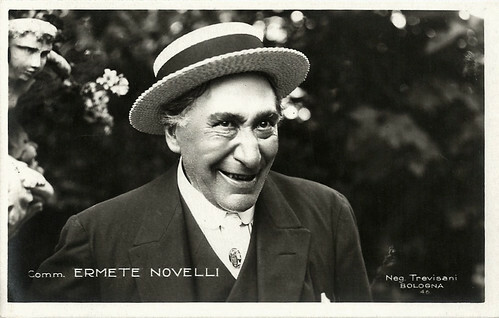 Ermete Novelli. Italian postcard by Ed. Vettori, Bologna, no. 46. Photo: Trevisani, Bologna. 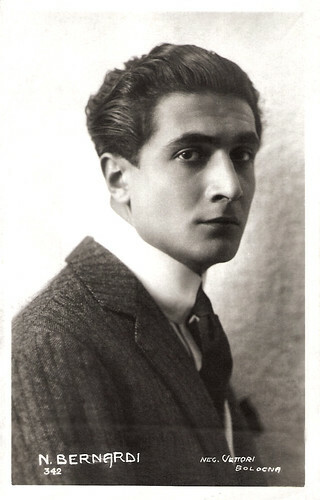 Renzo Ricci. Italian postcard by Vettori, Bologna, no. 49. Francesca Bertini. Italian postcard by G. Vettori, Bologna, no. 136. Ileana Leonidoff. Italian postcard by Vettori, Bologna, no. 147. Vera Vergani. Italian postcard by Vettori, Bologna, no. 265. Maria Jacobini. Italian postcard by Vettori, Bologna, no. 346. Sent by mail in 1926. 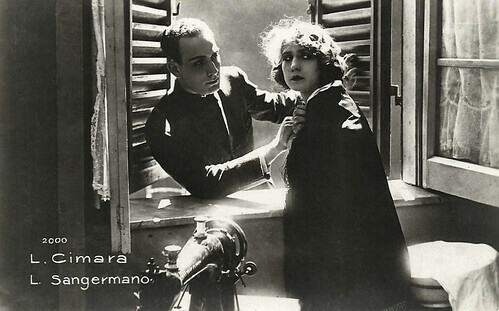 Photo: Maria Jacobini in Onestà del Peccato/The Wife He Neglected (Augusto Genina, 1918). Nerio Bernardi. Italian postcard by Vettori, Bologna, no. 342. 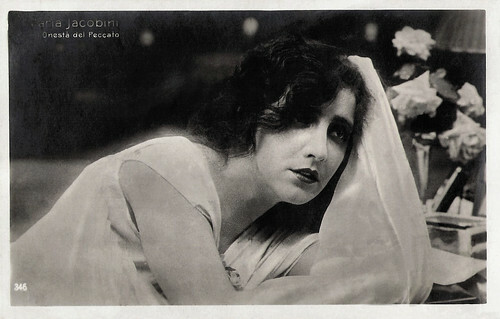 Pina Menichelli. Italian postcard by Vettori, Bologna, no. 492. 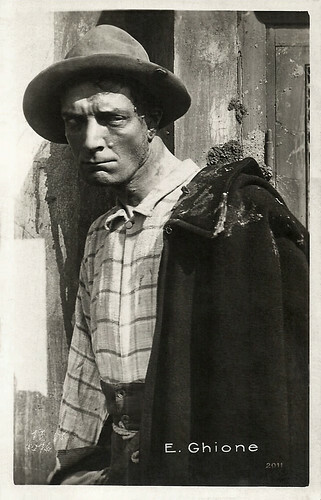 Photo: publicity still for Il padrone delle ferriere/The Owner of the Ironworks (Eugenio Perego, 1919). 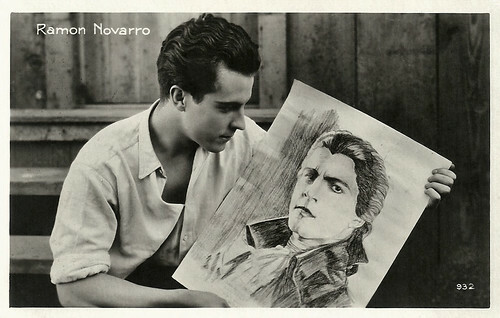 Ramon Novarro. Italian postcard by Vettori, Bologna, no. 932. Photo: the Mexican-American actor holding a sketch for the period piece Scaramouche (Rex Ingram, 1923), in which Novarro had the title role. 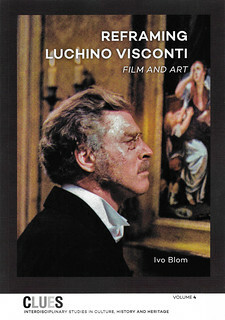 The film, produced by Metro Pictures, was based on a novel by Rafaele Sabatini, and co-starred Alice Terry and Lewis Stone. 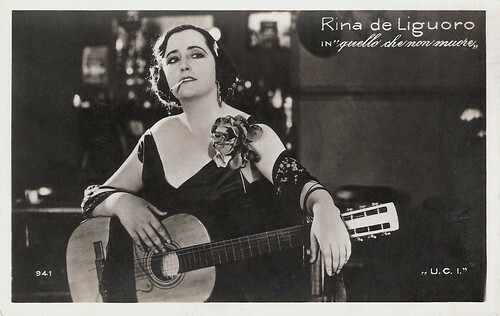 Rina de Liguoro. Italian postcard by G. Vettori, Bologna, no. 941. 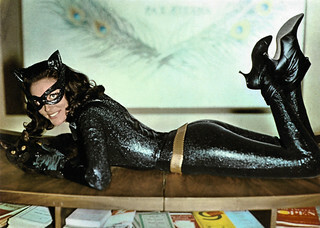 Photo: U.C.I. Publicity still for Quello che non muore/What does not die (Wladimiro De Liguoro, 1926). Alda Borelli. Italian postcard by Vettori, Bologna, no. 1057. Photo: Zambini, Parma. Italian postcard by G. Vettori, Bologna, no. 2000. Photo: Lucy Sangermano and Luigi Cimara acted twice together, in ...E dopo? 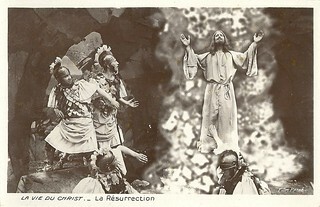 (Febo Mari, 1918) and La rupe tarpea (Gaston Ravel, 1920). Emilio Ghione. Italian postcard by Vettori, Bologna, no. 2011. Emilio Ghione as Za-la-Mort. 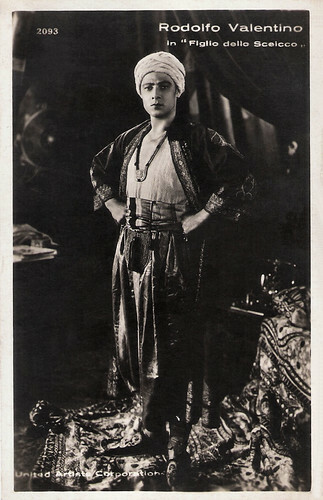 Rudolph Valentino. Italian postcard by Vettori, Bologna, no. 2093. 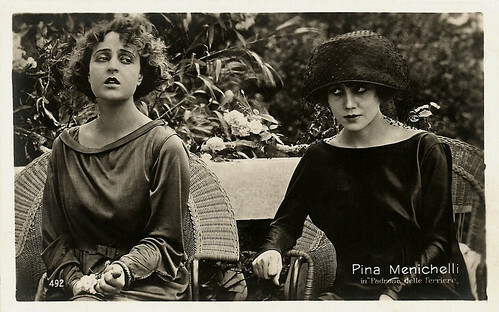 Photo: United Artists. 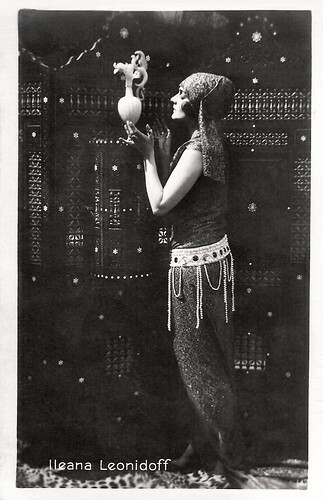 Publicity still for The Son of the Sheik (George Fitzmaurice, 1926). Rina De Liguoro & Ivan Mozzhukhin. Italian postcard by Vettori, Bologna, no. 3522. Photo: publicity still for Casanova (Alexandre Volkoff, 1927). Thank you for posting! I really enjoyed these postcards. It is amazing to me how quickly a famous person from the past is forgotten. It makes me happy to see your posts, knowing that the history of their performances and who they are are not lost. Blessings and hope to you today, my Friend. It is Spring here in the Willamette Valley!